It is time to introduce another of our newer Chainmaille Guild members. This week we are meeting Westminster Studios. Let's see how she tackled our questions. 1) How long have you been a Chainmailler? Not long, I fell in love with it this summer and find myself incorporating chainmaille design into my jewelry making whenever I can. I'm new to chainmaille but am learning new techniques all the time and really enjoy it. 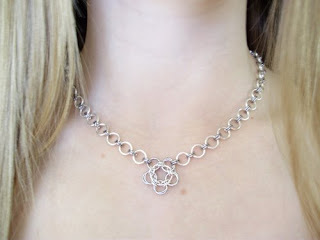 2) Why do you like Chainmaille? I'm an Art teacher by day and have always enjoyed methodical and meticulous types of art and craft. In the art realm, I love techniques like stippling and in the craft world I really enjoy crochet. Chainmaille has a similar meticulous nature that I really enjoy. It's like knitting with metal. I'm a very patient person (I have to be as a mother of five lovely children all close in age) and I enjoy and have high appreciation for craft that takes both skill and patience. 3) What is your favourite type of ring? 18 gauge--It's such a flexible size for creating new designs. I like to make jewelry that has a nice weight to it without becoming overwhelming and I keep coming back to 18 gauge again and again because I love the weight of the finished pieces. 4) What kind of items do you prefer to make? Right now I'm addicted to making bracelets, although I've also got a few necklace designs that I'm in the middle of on my design board. Because I'm a busy mom and also have a day job, bracelets are fun for me. I can complete them in a few sittings, in between diaper changes and making dinner. 5) Which weave would you like to learn that you dont currently know? I'd love to learn some three dimensional weaves. I've seen pictures of chainmaille spheres inside spheres and I just think that's really cool. I like the geometry of it, but have no idea how to do it myself. 6) Which piece are you most proud of? 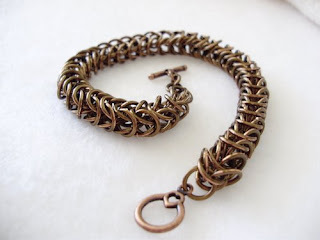 I have a steampunk vintage bronze colored copper bracelet that I just finished in the Puno weave that I then filed to give it a distressed look and let some of the natural copper show through. I'm a beginner, so I haven't yet tackled large and complex pieces. I have a chainmaille flower design of my own making that I'm chaining to create a necklace, but it's only half finished at the moment. I'm constantly learning and that's a lot of fun for me. 7) What advice would you give to someone who was considering doing Chainmaille? 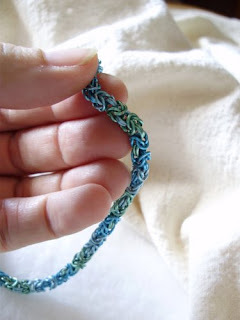 Find some online tutorials, get some scrap wire to practice, and just get started. You'll learn as you go and it's an interesting challenge. Thank you so much, and welcome to the guild.